A collection of generations of family recipes created in memory of my mother. 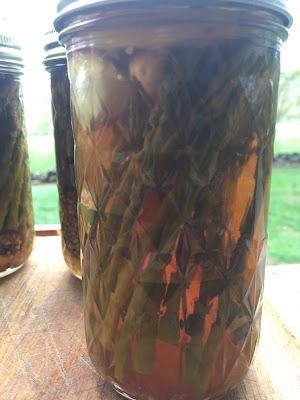 I used Marissa's Pickled Asparagus recipe almost to a T, except I was unable to get Penzey's pickling mix which leads me to believe that I will have a much sweeter pickle than I intended. Marissa's recipe can be found HERE but I will write it out my method below. One thing I regret not reading before I stumbled through the kitchen vying for available counter space was the recommendation to save the blanching water. 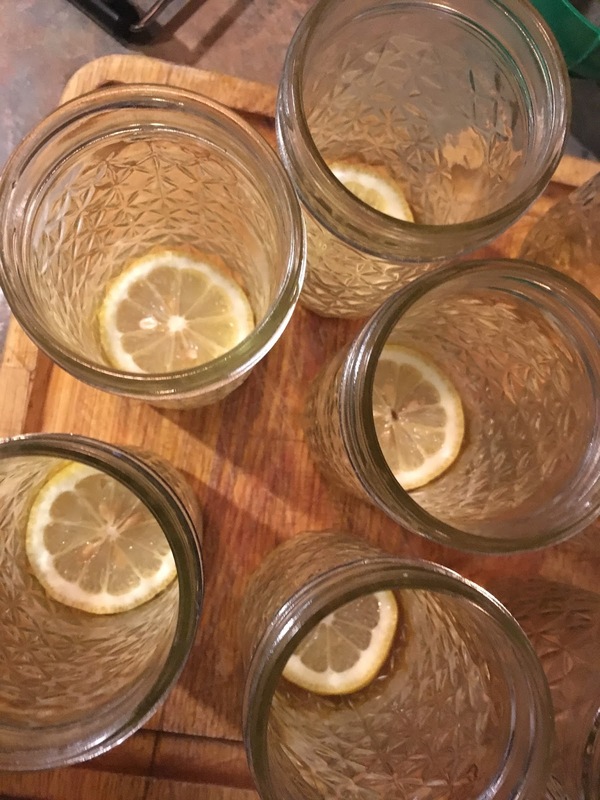 Drained and left to cool, it provides a nutrient rich (and sustainable) water to water the house plants with! 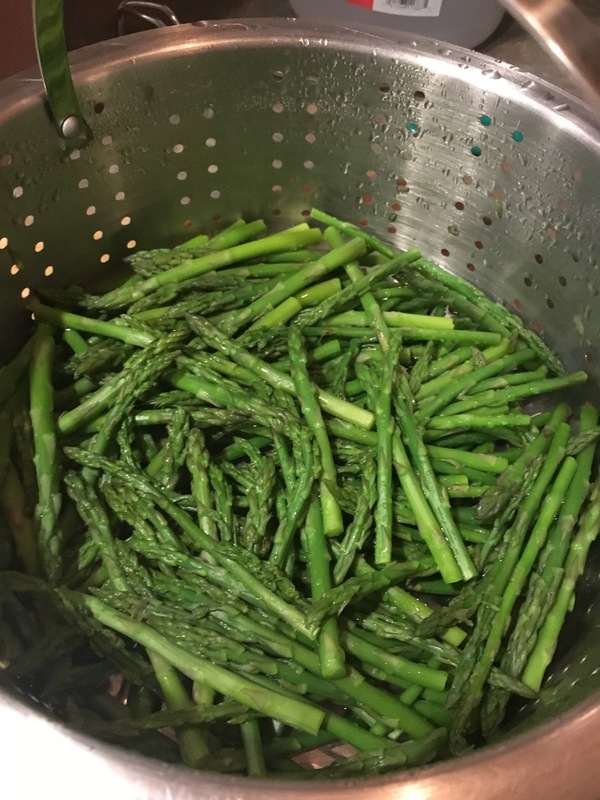 Thanks for the tip Marissa - no blanching water will ever go down the sink in this household again! This was nice to do on a rainy Mother's Day after a wonderful Eggs Benedict breakfast from SP. Anticipating the rain, we got 90% of the garden in yesterday which is a tremendous feat for Maine and our track record. I'm still itching to get out there and plant the 160 onions that are just waiting patiently on the porch. 1. 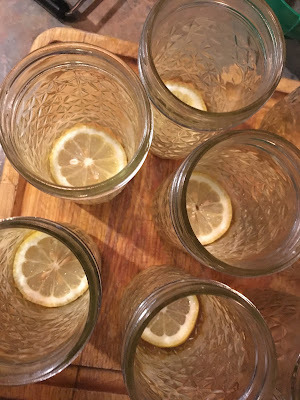 In a hot water bath, sterilize your jars. 2. 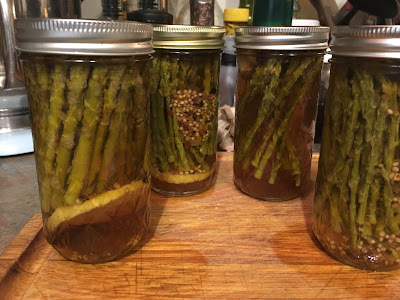 Put a lemon slice in the bottom of each jar and pack the trimmed and blanched asparagus into the jars. 3. 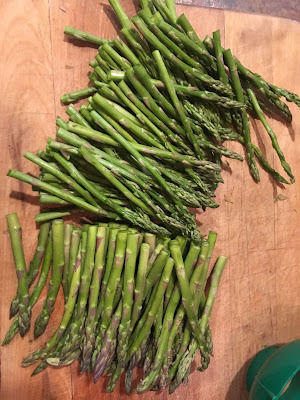 Tuck a garlic clove down into the asparagus spears. 4. Bring the vinegar, water and spices to a boil. 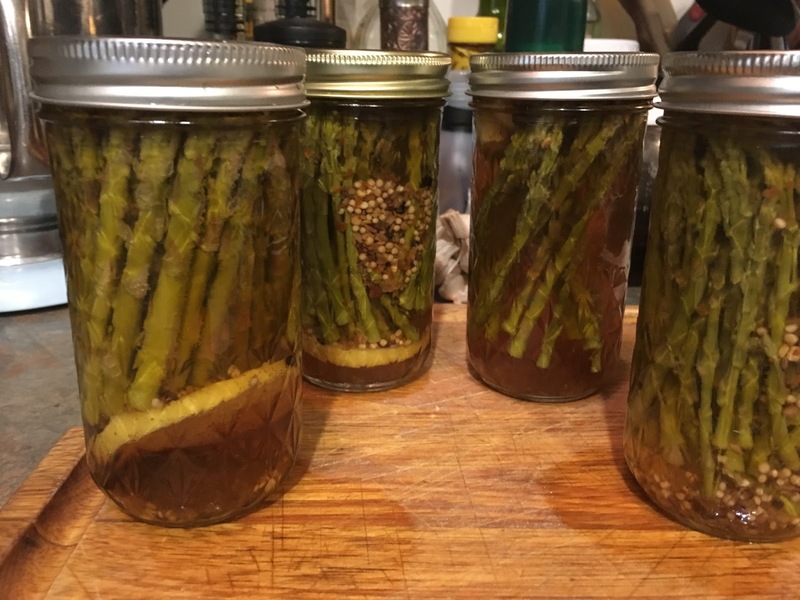 Pour into jars on top of asparagus, leaving at least 1/2 inch of head space. 5. Affix lids and rings on the jars and process in a hot water bath for 10 minutes (you can skip this step if you plan on just putting your pickles in the fridge). 6. 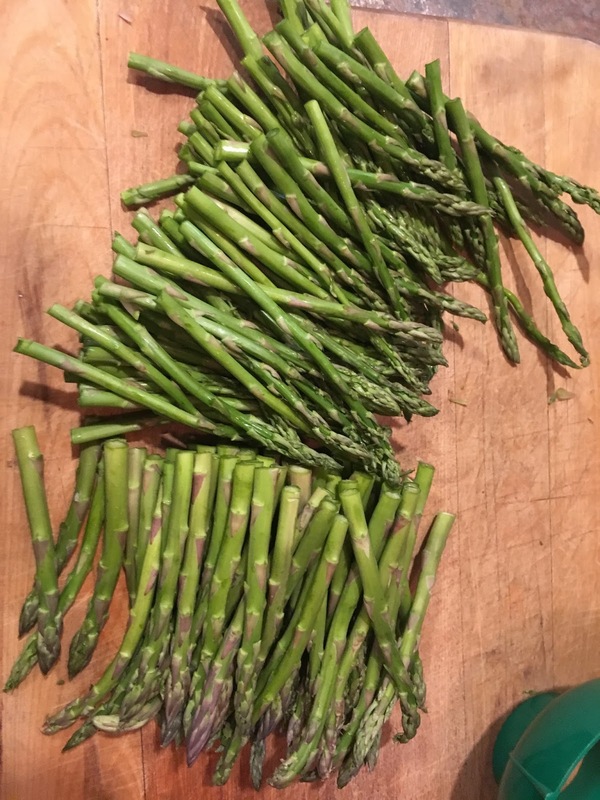 Wait at least 24 hours before eating, to give the asparagus spears a chance to get sufficiently pickley. 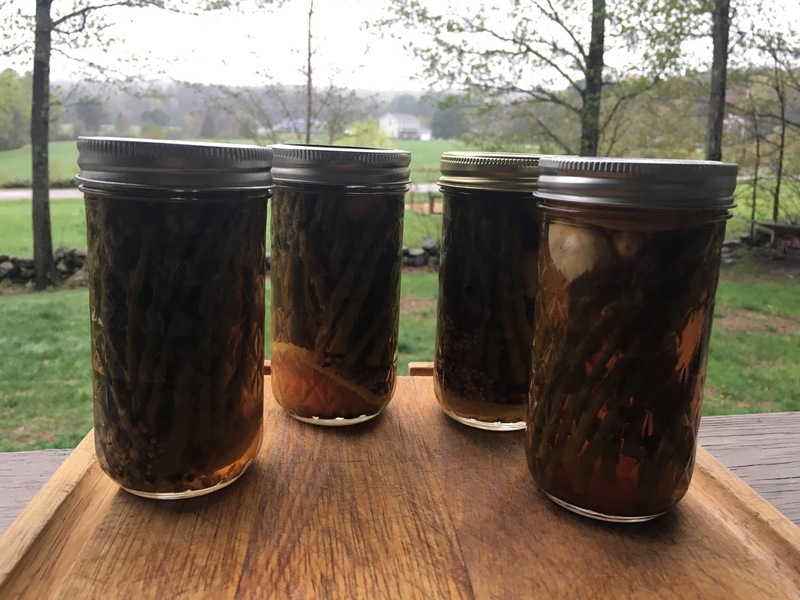 This picture is from the kitchen at the Merry Meeting Farm. A can of plum pudding exploded and they laughed and laughed and laughed! The photo was made into a serving tray, from which I made a digital copy. Pictured is my mother HiHo, my grandmother Mima, my great-grandmother BaBa, and some cousins. I am a mom of three children; trying to evolve, living locally and sustainably, and putting my MS to use, one ecological footprint at a time. I am a Native New Englander with a sense of wonder that began at a young age watching sunsets with my mother. I pass this on to my children and am preserving our family history in the process. A Merry Meeting to Everyone! My mother HiHo's love of cooking was passed on to me from generations before her. She asked us to remember her with flowers and music, but I also remember her with cooking. This blog is to share this love and at the same time preserve and publish the generations of recipes handed down to me from my family's kitchens all over New England. I encourage comments and stories. 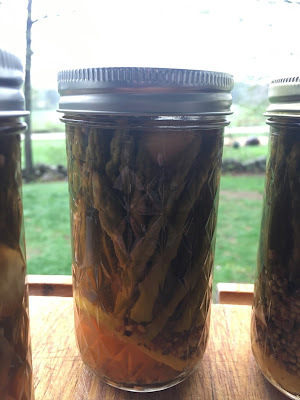 Just click on the recipe title, and the link will take you to the comment options. If you knew my mother or anyone like her, there are volumes of stories to share and I invite them to be woven into this blog. So anytime a recipe moves you to share a story, we'd love to hear it! Thanks for reading, now go cook! 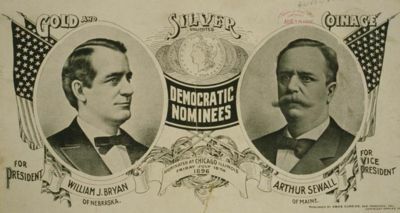 Arthur Sewall was a relative that ran as a VP nominee!